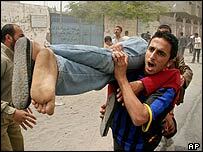 The United Nations Security Council has adopted a resolution condemning Israel's killing of civilians in the Gaza Strip. The 14-0 vote came after at least 10 Palestinians were killed and 60 wounded when Israeli troops opened fire on protesters in the town of Rafah. The resolution also urged Israel not to demolish homes in violation of international law. 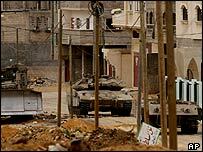 Overnight, five Palestinian militants were killed by troops in Rafah. Three died in a missile strike, while another two were killed by a tank shell, as Israeli soldiers pushed into two more suburbs. The US, which usually vetoes anti-Israeli resolutions, abstained from the vote. In a further rebuke, the White House issued a statement criticising Israel's actions in Gaza in recent days. "While we believe that Israel has the right to act to defend itself and its citizens, we do not see that its operations in Gaza in the last few days serve the purposes of peace and security," White House spokesman Scott McClellan said. "They have worsened the humanitarian situation and resulted in confrontations between Israeli forces and Palestinians, and have not, we believe, enhanced Israel's security," he added. US Secretary of State Colin Powell reinforced the message, saying: "I believe the activities of the Israeli Defence Forces in Gaza in recent days have caused a problem and have worsened the situation, and I think made it more difficult for us to move forward and get back into the peace process." UN Secretary General Kofi Annan and the European Union have also condemned Israel's actions. More than 30 Palestinians have been killed in Israeli raids in Rafah since Tuesday, while the UN says house demolitions by the Israeli army have made about 1,600 Rafah residents homeless. The army says its operations are designed to smash tunnels used to smuggle weapons under the border with Egypt. Wednesday's killings happened as about 3,000 demonstrators marched down Rafah's main street towards Israeli lines in the Tel Sultan area. The Israeli army said one of its helicopters fired a warning missile at open ground to hold back the crowd after several gunmen were spotted among the marchers. When the crowd continued to advance, the army said, four tank shells were fired at an abandoned building which obstructed Israeli soldiers' view of protesters who were passing behind it. At least one of the shells tore through the building and hit the crowd, it added. The Palestinians have denied Israeli allegations that gunmen were among the demonstrators. The Israeli army later issued a statement expressing sorrow over the deaths. Lt Gen Moshe Yaalon said the soldiers did not deliberately fire on the protesters. "We're sorry that innocent civilians got hit, we don't aim at Palestinian civilians," he said. But the Israeli Defence Minister, Shaul Mofaz, said the Rafah operation would continue. Palestinian leader Yasser Arafat has called for international observers to protect his people, describing the events in Rafah as "atrocious crimes". He described the civilian deaths as a "massacre that stands against all humane, civilised and political principles". The UN Security Council resolution was put forward by Algeria, the only Arab nation currently in the 15-member council. "[Israel] cannot continue to flout its authority and norms of international law with impunity," said Algerian ambassador Abdallah Baali. Israel's ambassador to the UN, Dan Gillerman, said he was disappointed at the council, which took no action when Israelis were killed. He claimed that high-quality weapons were being smuggled into Gaza, some of them through tunnels on the Egyptian border. "In fact, the whole of Gaza, and Rafah in particular, is on the verge of becoming a missile base aimed at Israel's cities and civilians," he said. "What would the international community have Israel do? Just sit back and wait for this horrific scenario to materialise?" The deputy US ambassador to the UN, James Cunningham, told the Security Council that he had abstained rather than vote for the resolution because it did not address terror. "It is clear that Palestinian terrorists have been smuggling weapons into Gaza through tunnels in Rafah," he said. "It is clear that the Palestinian Authority has not taken serious action to address this threat or to put an end to terrorist acts." Nasser Al-Kidwa, the Palestinian UN observer, accused Israel of conducting a "barbaric military campaign against the Palestinian people". "Scenes of bloodshed and panic in the streets of Rafah"